Have you ever wondered what it would be like to build a computer from scratch, and make it work the way you want? Before personal computers such as the Commodore PET-2001 or the Apple 2 became available in the late 1970s, the only way for an individual to own a computer was to build one yourself. And every self-built computer could be unique, customized to the wishes and interests of the person who built it. The ability to build a computer from scratch, and having a deep understanding of how it works, is (arguably) a lost art nowadays. The Propeddle tries to change this. It is an open-source electronic kit, available (soon) from tindie.com. It only uses through-hole components (no SMD) so it should be easy to solder together even for those who have limited soldering experience. You can also purchase it pre-assembled for a small extra charge. 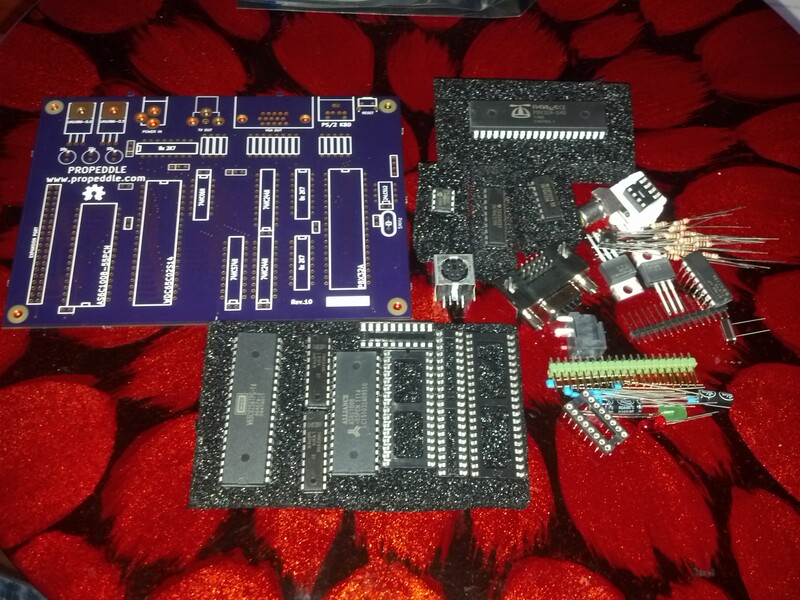 All the parts that are needed for a Propeddle Rev.11. Except there is no Rev.11 PCB yet, only a Rev.10 PCB. Propeddle is not an emulator and it’s not a replica of any existing computer — it’s something in between. It uses a real 6502 processor as CPU, and a real Static RAM chip as memory. A Parallax Propeller generates the clock and other signals needed by the 6502, and it also controls the memory chip. Furthermore, the Propeller can provide video output (VGA, NTSC or PAL), keyboard input (PS/2 connector) and a serial connection. You could say that the software running on the Propeller determines how the 6502 sees the world; that’s why it’s called a “Software Defined Computer”. The name “Propeddle” is a contraction of “Propeller” and “Peddle”, in honor of Chuck Peddle, one of the engineers who designed the 6502. Bill Mensch will be honored in a future product. Propeddle was inspired by the Prop6502 project by Dennis Ferron. Thanks for sharing, Dennis! More information will appear on this website and on the Propeddle Google Plus account. Before the Propeddle website existed, I wrote a lot of information in the SavageCircuits forums; those posts are available on the Zappbots website now. Thanks for reading, and don’t forget to check out the links on the right!